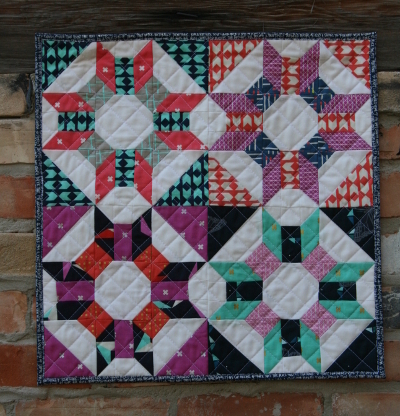 I made this mini quilt over a year ago, before I ever mailed my Wishing Well quilt off to Quilty magazine for publishing. It’s time to share some photos of it! Before I say more, I need to confess something. I never wanted my Wishing Well quilt to have that name. 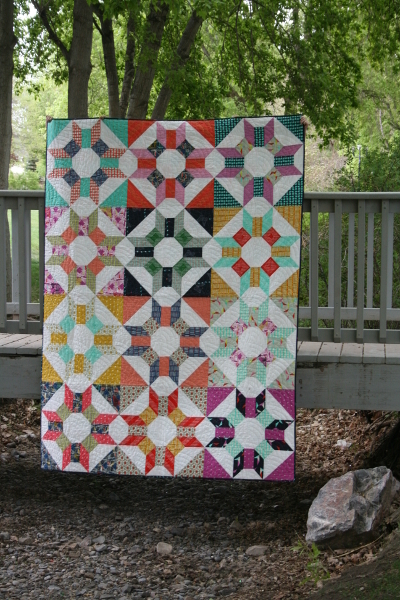 I wanted to call it “Prosper.” Here’s why: back in June of 2014 I got a random email from Mary Fons asking me to design a quilt for Quilty. I was stunned. I even thought it might be a hoax of some kind, until I replied to the email and it turned out that I really was communicating with THE Mary Fons. Shortly after that, I was pondering 2 Chronicles 20:20 which reads, “Believe in the Lord your God, so shall ye be established; believe his prophets, so shall ye prosper.” I was pondering it because it was part of a lesson I would teach at church, but personally the word “prosper” really grabbed me. We were experiencing some trials at the time that didn’t feel anything like prosperity, but instead felt like the opposite. I found it interesting that this verse didn’t connect prospering with material resources at all, but instead aligned it in relation to belief. It was so opposite of what the world describes as prosperity, and I found myself mulling it over a lot, looking for ways in which we WERE prospering, ways less obvious to me until I went digging. Then one day I stumbled upon a tiny drawing – no more than one inch square – of a vintage quilt block called “prosperity.” The name caught my eye and because of my personal musings I began examining the block and kind of liked it. 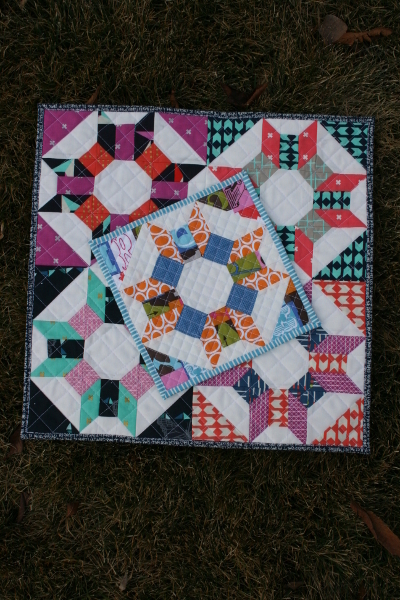 I did some internet searches to see if anyone else was making the prosperity block and found nothing, so I went to work adapting the quilt block to contain no Y seams, and enlarging it for a more modern feel. Thus my design was born, and the quilt was made, all to the tune of that verse of scripture in my mind. Need a reminder of the original quilt? 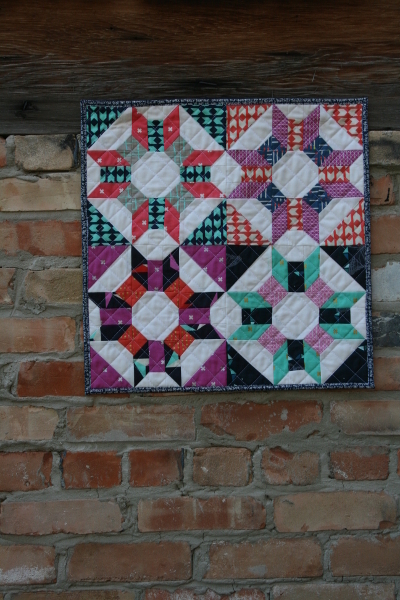 It was really fun to make, and I especially enjoyed quilting it in with a small crosshatch pattern. 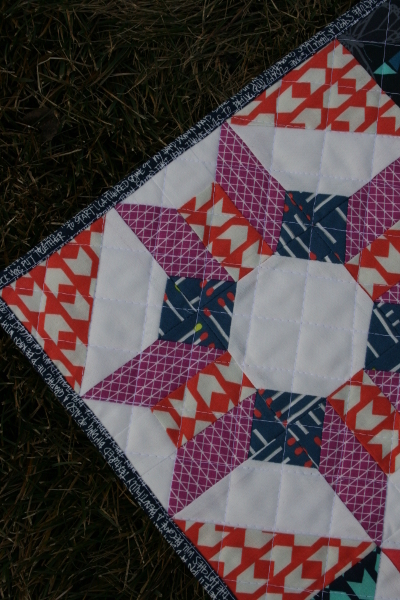 I enjoyed it SO much that I took my test block and quilted it too, with rows even closer together. This mini finishes at 9 inches square and makes me giddy with happiness. 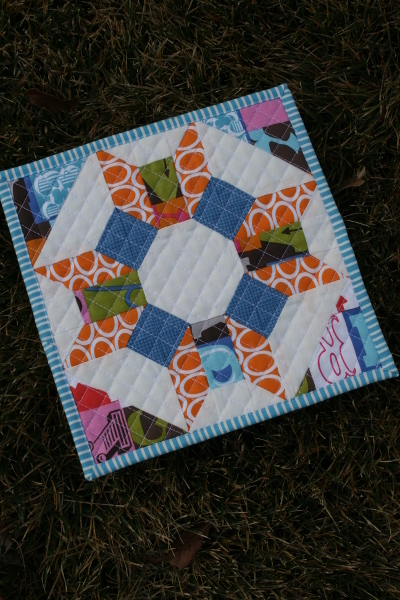 I love the tiny quilting! The larger mini I backed in a coordinating pink fabric and bound with my favorite navy Architextures text print. The tiny one I backed in the same fabric I used to back the original quilt – a Maude Asbury for Blend fabrics alphabet print. 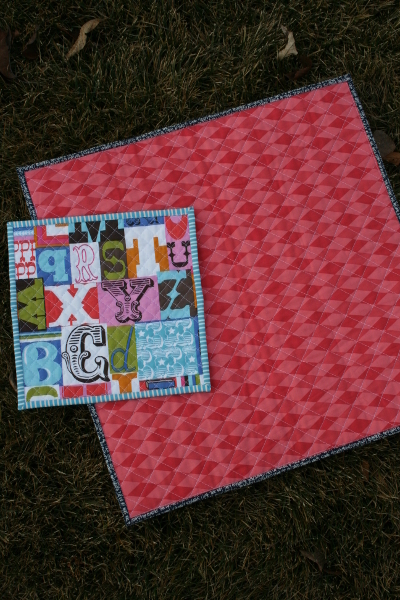 So there you have it: two mini quilts I made almost a year and a half ago. Ha! I must add a little to the story. It’s true that you can prosper even when hard things are happening, even when personal, health, family or financial struggles abound. I’m sure I haven’t learned as much about this as I’ll someday understand, but I do feel like I’ve had kind of a prolonged tutorial in this, perhaps partly because I’ve thought about it so much. I hung the larger of these quilts in my closet of all places, beneath a sign that says “rejoice” and I look at it every day. It’s a reminder to me that we are rich in blessings that can’t be measured, and there is always something to be happy about. Especially if I have the courage to look for it and truly see it. There have been days – more than I care to admit – when I didn’t have the courage to rejoice, but seeing this quilt reminded me at least that it wouldn’t be permanent, and that somewhere up ahead there are good things in store. So wherever you are, may you prosper today! Thanks so much for your ponderings and your prosperity quilts. We too often forget that there are other blessings than merely those of the material world. Love your work! I like that a lot…it’s amazing how different it looks with different fabrics. I think I’d like to make a 36″ block for a baby blanket some day. It is so fun to see you and your family. They have grown so much. You are really becoming something in the quilting world. I love seeing all that you are accomplishing while you are raising your wonderful family. Our family has such great memories of your time spent in our area. We are now living close to you. We will have to touch bases soon.